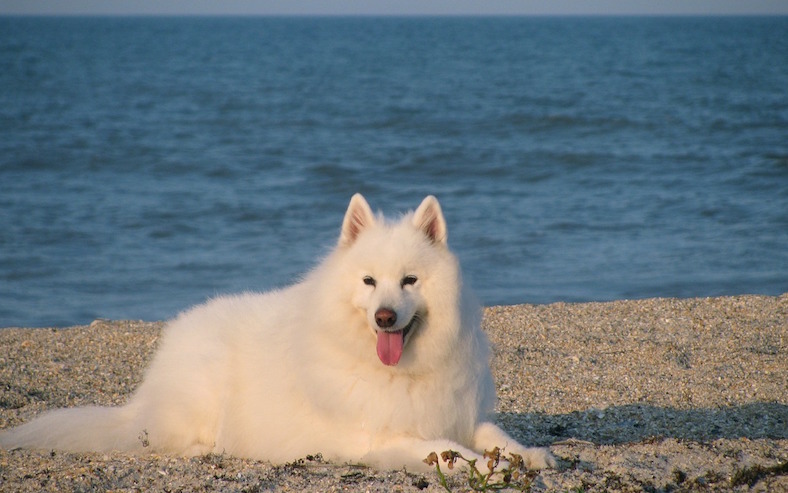 When our family moved to an island off the coast of North Carolina in the mid nineteen eighties, a beautiful purebred Samoyed was part of our family. It was the dog breed to which we were partial, until in our later pet owning years we decided that adopting rescues was the way we wanted to go. I was young and status conscious in those days and as I recall, probably felt a teensy bit arrogant about our dog. So I was dumbfounded when the local teenage boys who helped us unload our U-Haul saw our dog and nonchalantly informed me that the local deputy in this town of five hundred people had four of these dogs. “You must be mistaken,” I remember telling the kids. Surely this man had some sort of mixed breed that was big and white — no one in such an isolated area, especially in the rural South, would be sophisticated enough to have a Samoyed. “Nope, they were just like this,” the boys insisted. I refused to believe that anyone in this tiny backwater town would be refined enough to have not only one — but four — of these stunning creatures. Small town that it was, news traveled fast and it was no time at all before the deputy’s wife came calling, wanting to see our dog. Sure enough, it turned out that the teenagers were absolutely correct — we weren’t as cool as we thought we were. And not nearly as cool as I think we are now, with rescued pound puppies.